I’ve struggled with back pain since I was 12 years old. I’ve been to at least 100 chiropractors, physical therapists, and doctors (including an orthopedic surgeon). I figured I just couldn’t really get relief for more than a day or 2. Robert has helped me more than all of those other people compared. If I had to guess what the main reason for that is, it would probably be because what he does is so tailored to the individual and he is not just practicing some cookie cutter massage. Whatever the reason, I am pain free for a minimum of two weeks after a Thai massage session. That is unheard of for me. Just got back from my first Thai Massage. It was wonderful. I have some back issues but he was aware of them and worked around them. I had questions. He had answers. If I wanted to talk during the massage, we talked. If I wanted quiet, he was quiet. He was very attentive every step of the way. I like a little pain to know what needs fixing and let him know what was just uncomfortable and what hurt. He adjusted accordingly. He made me feel comfortable instantly. I’m socially awkward and comfort level is very important to me. Robert has helped me with chronic migraines and back pain. He’s taught me how to stretch and use a foam roller to correct my posture. He’s very focused on helping people get better… Not just for a little while but for good. His Thai Massage is unlike anything else I’ve ever tried. I thought I had chronic pain that would never improve, but he’s turned that attitude completely upside down. I highly recommended him for anyone with chronic pain issues. I first met Robert when he came to the massage school I attended. His passion for helping others and his great personality made me want to find out more about what he does. I took his Intro to Thai Massage class to learn more. The class was amazing! He keeps the class size small and helps you along the way with one-on-one guidance and includes an amazing workbook to take home and practice what you learn. He also holds shorter 2 hour mini-classes that cover a ton of interesting topics for both massage therapists and Thai Massage enthusiasts alike. What I love about his teaching is that the classes aren’t just for massage therapists, they’re for anyone who wants to learn more about Thai Massage or just how to make themselves feel better. I would highly recommend checking out his classes- even if you’ve never had a Thai Massage before. Robert is super-friendly and no one feels like a stranger when they walk into his studio. I’ve been getting regular massages for well over a decade. Most have been for pain relief and have fallen WAY short of my expectations. Robert is one the few therapists that I have been to that I feel have actually put my specific needs first in planning and performing a session. As a massage therapist myself, I know it’s easy to get stuck in a rut and let your mind wander from your top priority- the client; but with Robert, you can really feel through the entire session that he’s focusing his whole self on you and your treatment. If you’ve never had a Thai Massage before you don’t know what you’re missing… And Robert is the best in area! I’m now spoiled and don’t want any massage other than Thai- or any therapist other than Robert! I highly recommend Robert for both his classes and his massage sessions! Robert is in a class all his own!! I have tried many doctors and even massage therapists with a great amount of relief for my pain but, when Robert worked on me using Thai massage, everything changed. I could tell he was able to work places in the muscle structure where nothing else I had tried before was able to. AMAZING! He has a passion for healing and helping people and you can feel that when you’re around him. Robert is awesome! His passion for Thai massage and helping others really shines through in his work. I felt safe and relaxed throughout our time together, and I would totally recommend him for anyone in need of a good wringing out from life’s stresses and strains. Robert is very dedicated to the craft of massage, Thai massage, and yoga. In addition to his formal training, he has developed a lot of expertise through his own self-study. I think you’ll find him willing to engage any questions you bring him with specific and detailed answers. In addition, he can help you feel more coordinated, flexible and together in your body. I worked with Robert a number of years ago now – we presently live in different cities – so I imagine he has honed his craft even more by now. Highly recommended. Robert is the Bruce Lee of Thai Massage! Just had my first Thai massage from Robert, and it was wonderful. I spend tons of time sitting at a computer, so I constantly have stiffness in my back, neck, and right arm. His bodywork took a full two hours, and it was a mix of pleasure and pain — but the pain only proved to me just how tight and contracted my muscles are, and how badly I needed this! The Thai massage was not your standard relaxing table massage – he really isolated trouble areas and worked them hard, until the muscles started moving in the ways they were supposed to. I feel like I’ve actually had reparative work done on my body, as opposed to just getting a massage that feels good for a few hours. Robert is also very professional and clearly comfortable with his work, which helped it not feel awkward being pulled and pushed and tugged for two straight hours. I look forward to doing this again! No one, and I mean No One can say they do what Robert does. His techniques are completely different and much more effective than those of your average massage therapists. Not only would I recommend his services, but would encourage other massage therapists to study his methods and/or attend one of his classes… you’d be selling yourself short otherwise. Robert was the perfect choice for my first ever Thai massage. This was totally different than the regular massages I have experienced as it is more interactive and involved much needed stretching. Robert is an absolute professional, used just the right amount of pressure and gentleness, and stretched me out completely. Nice, local (Round Rock) Yoga teacher with a small and intimate studio setting. Robert is very professional and caring. This is the first time I had a Thai massage, which is quite different from what people typically think of as massage. Gentle stretching and loosing up muscles and joints provided a relaxing experience while also making me feel lighter and more centered in my body. I was surprised to find out how much tension I had in my forearms from sitting at the computer typing for hours each day. Robert smoothed that out and got the blood flowing! I highly recommend Robert’s services. I first came to Robert when my poor posture habits sitting at the computer resulted in lower back pain. I’d seen him use the Ma Roller before, and he recommended I use it while lying down, moving it up and down the lower lumbar area as needed. Two weeks later, the pain was gone and has not come back. The following year after several days of participating in creating a huge outdoor art project, my body was so stiff I could barely move without pain. One Thai Yoga Massage by Robert, and I was 90% better the next day. No Swedish massage therapist, vigorous practitioner or otherwise, has ever accomplished that much in one session. I’ve been a convert ever since. Recently I began taking his yoga classes. He’s a very understanding and patient teacher, helping this out-of-shape beginner through every step. I’m a registered massage therapist myself, and I’ve enthusiastically recommended him to a number of friends, and would to anyone reading this. He’s a gifted bodyworker and teacher. This man consistently provides great value and brings healing wherever he goes. Rock on, Robert. This is a great deal. Robert is an excellent instructor and the atmosphere is very relaxed. I do not have remotely the figure of the models in yoga magazines and I feel very comfortable practicing yoga at this studio. Robert is quick with explanations and patient about finding ways to make the poses work. This year I found Robert and he began giving me messages and I saw a lot of change in my pain level and how my body moved. I enjoy both the table and Thai massage. We often do a combination of both. After many discussions on yoga and the additional benefits I could receive from the practice, I finally tried his class. I love the yoga class. I have more range of motion and enjoy the small class sizes. With fewer students in the room, you have more individual attention. I have enjoyed meeting all the other people that have attended the classes in the last year. And since Robert already knows where my pain is, he is able to customize each class to what is happening with our bodies that day. I am so sad that I will be moving to Houston and won’t be able to attend class. I give Robert an A+ for his philosophy and care for the human body. You will find a comfortable environment to explore yoga and will never feel out of place no matter your level of experience. Thai massage is great!!!! I feel wonderful, my posture is so much better, when I got in my car..I had to adjust the mirrors because to my surprise, I was sitting straight up…wow…that felt good. Thank you, Robert…. After spending my first few years in Austin trying out different massage therapists and never quite finding one that was the perfect fit, I started working with Robert, and I finally settled on the perfect therapist for my needs. Robert’s Thai massages always leave me feeling like I’m standing two inches taller and walking on air. My tight shoulders and hips feel fantastic, and I love the way my body feels. The studio is a great atmosphere, and he’s a total professional. Thai massage is (at least in my opinion) more intense than a table massage, but it’s exactly what I need for my body. I love feeling like I’ve I’ve worked my body while relaxing. Thai massage with Robert is a transformative experience, and hands-down the best massage in the Austin area. Robert has been my massage therapist for about two years, through some of the most stressful parts of my life. His Thai work has kept me healthy and limber through all of it, and his easy-going and informative manner has helped me improve my flexibility outside of his sessions, as well. Robert is a consummate professional body-worker. Whether it’s yoga, thai massage, or tasty food and vermiculture, he’s always working to expand his knowledge and his ability to help people get and stay healthy. As a woman working two jobs (one 40 hours a week sitting in a desk, the other as a wedding & portrait photographer), a family, and all of the physical and mental stress that comes with these daily tasks – I can honestly say that Robert has changed my life in both how I cope with stress and how I feel day to day. Robert, and have been taking yoga classes regularly for the last year. I have had regular bodywork in the past, and the difference in how I feel after receiving bodywork from Robert is by far more noticeable than any other therapist I have ever seen. 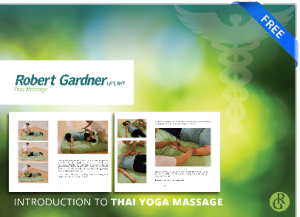 For those of you out there that haven’t experienced Thai massage – – – you need to see Robert. But what has made the most obvious impact for me is the weekly yoga classes. Robert is very sensitive to the different needs of all of his students, regardless of physical conditioning, experience with yoga, or any other factor. His studio is a very comfortable space to learn yoga at any skill level, and he is very skilled at providing directions that allow me to understand the poses. Without exception, each and every time I go to class – no matter how tired, stressed, crappy, whatever I feel – I leave feeling relaxed and relieved. Attending class regularly, I have seen impacts in other areas of my life… particularly in times of stress where I swear I can hear him say (as he does in class) “breathe!!!”. So, if you’re looking for a great massage therapist, wondering what Thai massage is all about or searching for a great yoga class – get in touch with Robert.